The CW has unveiled a first-look picture and trailer for DC’s Legends Of Tomorrow. When heroes alone are not enough… the world needs legends. Having seen the future, one he will desperately try to prevent from happening, time-traveling rogue Rip Hunter assembles a disparate group of both heroes and villains to confront an unstoppable threat to the planet…and to time itself. Based on established characters from The Flash and Arrow, the spin-off stars Victor Garber as Prof. Martin Stein; Brandon Routh as The Atom; Caity Lotz is resurrected as The White Canary; Dominic Purcell returns as Heatwave, alongside Wentworth Miller‘s Captain Cold. New characters include Arthur Darvill, as the aforementioned Rip Hunter; Ciarra Renee plays Hawgirl, and Franz Drameh‘s identity is yet to be revealed. The series is made by Bonanza Productions Inc. in association with Berlanti Productions and Warner Bros. Television. 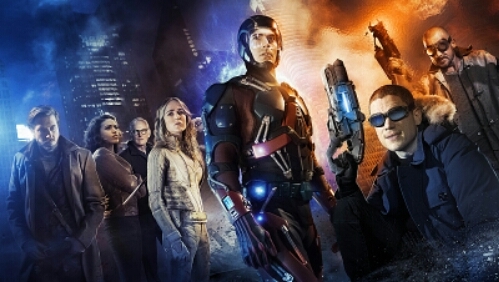 DC’s Legends Of Tomorrow is due to air early 2016.